Our services also include custom emergency management mapping for local police, fire, and EMS departments. We can prepare detailed wall maps, printed atlas books, and electronic geographic data sets containing each highway, road name, and address point within a defined area such as a municipal fire agency or county. 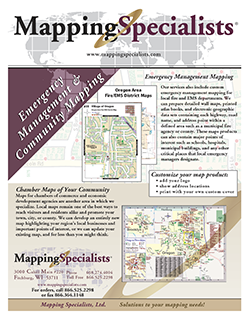 Mapping Specialists can also create evacuation maps for buildings or municipalities. Maps for chambers of commerce and economic development agencies are another area in which we specialize. Local maps remain one of the best ways to reach visitors and residents alike and promote your town, city, or county.